Conditions Governing Access: Open. Catalogued imagery is accessible via the NCAP website. The Environment Agency (EA) collection contains aerial photography of locations across south-east England. The agency was established in 1996 to protect and improve the environment of England. It works to create better places for people and wildlife, and supports sustainable development. 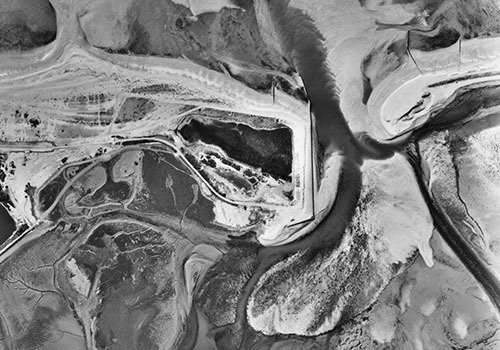 Pagham Harbour, West Sussex, photographed by Meridian Airmaps Ltd in 1982. This is one photograph from a survey of the Sussex coast, commissioned by the EA to assist its work in monitoring coastal change. The sheltered inlet of Pagham Harbour is an internationally important wetland site for wildlife. The EA regularly commissons aerial surveys to support its work. Following analysis and exploitation of the imagery, its holdings of analogue aerial photographic film covering south-east England were transferred to the care and management of NCAP in 2016.